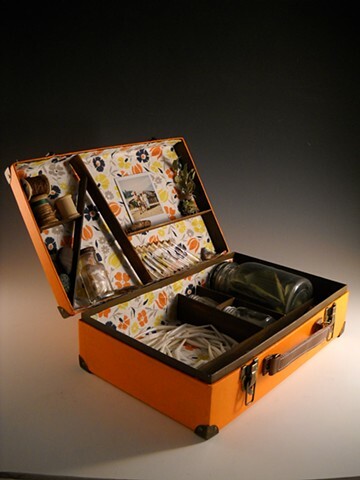 This Memory Kit was created for the 2013 exhibit Fix the Earth NOW at the Goudi'ni Native American Contemporary Gallery at Humboldt State University. It captures the moments I spent as a young woman in a world renewal ceremony, the Jump Dance, for me dancing in the ceremony marked a coming of age. These are the items that coalesce into a tangible memory of that time. The hot sandy dirt on my bare feet, the sweat dripping into my eyes as I stared across the river at a Madrone tree, to concentrate on the singer, and not my thirst or hunger from fasting. They are marked objects of my experience, that goes beyond those singular memories, to one that is specific to what other women experienced in this same role. I'm honored to have taken part, and to document my time in such a way. Especially now that I feel so far away from that time.